For owners, dog safety is an exercise in anticipating the possibilities. Our homes, yards, cars, parks, and public places can be filled with potentially unsafe situations for dogs. Is your home safe for your dog? Dogs operate in a world of smells and heightened hearing. Dogs can understand some human language, but they communicate with each other using body language and other visual cues. Dog communication and interpreting dog signals is too complex a subject for this website, so we have provided some references at the end of this section. While it may be an overly simplistic point, not all dogs are friendly. All too often human owners are busy talking with each other while trouble may be brewing at the end of their leashes. Remember that dogs, like humans, have their preferences regarding the company they keep. There are dogs they genuinely like, those they tolerate for the sake of their humans, and those that they perceive to be threatening. All dogs will react if threatened. It is never safe to assume that the dog that is approaching you is clean (parasite and disease free), well trained, or friendly. Dog fights are probably every owner’s worst fear, the signs leading up to them can be subtle, and they can erupt seemingly instantly. Our purpose here is to provide some tips that can help avoid problems, and refer you on to some other good sources of information. How many times have you seen a dog walking their person? The dog is out on the end of a long lead, nose to the ground, drifting from one side of the sidewalk to the other searching out good smells while the owner is being pulled behind. This owner has little control. Their dog has a wide radius to move around, and can lunge, pulling the person off their feet, or the leash out of their hands. In addition to being dangerous to their dog (who could easily dart out into traffic etc. ), this owner’s behavior is also dangerous to yours. After all, your dog could be what is being lunged at! When walking in public or in crowds always have your dog under control; leashed and kept close to you. Flexi Leads are designed to give a dog freedom and mobility, the exact opposite of what you want when walking down the side walk or in close quarters. Use a Flexi lead when you get to the park and want to let your dog run. Use a regular lead to get to the park. Leads are made out of many materials (Leather, cotton, nylon), and it is important to find one that is comfortable on your hands. Leads do not need to be longer than six feet. For sporting breeds use of a choke collar allows you to make effective corrections as you walk (we recommend wide nylon choke collars because they do not put excess strain on the neck). The importance of obedience training cannot be emphasized enough. Going to classes and teaching your dog how to walk on a lead in the presence of other dogs is the first step to pleasurable walks. Free running dogs are another potential problem. Dogs can run faster than people, and can quickly disappear from their owner’s sight and out of hearing. There are dogs that reliably respond to off lead commands, but this takes a lot of training. Sometimes dogs have selective hearing; what is more interesting, you or the rabbit, bird, or other dog across the park? If another dog is charging at you, do not assume it is coming to merely greet your dog and move on. Call your dog close to you and be prepared to intervene. The same applies if you are letting your dog run in a fenced in dog park. Be alert. Watch how your dog is interacting with other dogs, and be prepared to intervene. An excellent and entertaining read about dog and human communication and behavior. While this book is meant to help owners that have leash aggressive dogs, it alerts readers of what to look out for when on lead and strategies to prevent conflicts. There are dog people and non dog people. Not everyone is forgiving of being jumped or slobbered on. A well mannered dog is always more warmly received and tolerated. Obedience courses (especially Canine Good Citizen) help you shape the behavior you want. Some people are afraid of dogs. If this is the case, do not press the matter, but do not allow a human reacting in fear to psychologically or physically damage your dog. Conversely, some dogs are afraid of some people. Again, don’t try to force a relationship if the dog is uncomfortable. Patricia McConnell’s book The Cautious Canine: How to Help Dogs Conquer Their Fears offers some good strategies for overcoming fears. Many people have little or no experience interacting with dogs. The two species communicate very differently. Often well meaning people will unknowingly provoke an unwanted response that may be perfectly reasonable from the dog’s point of view. An owner’s role is to supervise interaction and make sure your dog feels safe, instead of cornered, taunted, or threatened. This is especially important with children, who must be taught how to play with dogs appropriately. It is a good idea to set up some ground rules before introducing the dog into company. You can reasonably expect to control most of your dog’s behavior with training, but you have less control over human beings. Make sure guests are closing and locking gates behind them, sharp objects are not pointed downward such that a dog could walk or jump into it, and lit cigarettes are not held at a dog’s eye level. Also make sure that guests are not subverting your training by allowing them on sofas that you do not, giving commands that are not the same as the ones you use, feeding them things that you do not allow them to eat or things that may be toxic (chocolate). Even well meaning people can unknowingly cause damage. A polite correction is usually all it takes to stop a potentially harmful action. On a therapy visit a sweet little old lady was about to treat our dog to a chocolate cookie. She was just as happy to give the dog a treat that we had brought. Choke collars should only be used for training or walking on a lead. They should not be left on as a permanent collar. Choke collars can get caught on crates, fences, etc and a panicked dog can strangle itself trying to get loose. A buckle collar is safer for every day around the house. Closed vehicles heat up dangerously fast, even on days humans do not consider particularly hot. Buying a light colored vehicle (white, silver, tan, etc) dramatically reduces heat build up. Parking in the shade and covering the windshield with a silver reflective tarp also helps. Leave your car open (the back hatch, side doors, front windows) for ventilation and to capture any breeze–simply padlock your dog’s crate. Always make sure your dog has plenty of water. We strongly advocate using crates in the car; preferably wire crates so that air can reach the dog when doors are left open. Crates keep a dog secure and safe and out of the driver’s hair. We know of several unfortunate situations where a driver got into an accident and loose dogs were tossed around the car sustaining serious injuries. In one case the dogs were fine, but the driver was injured from being hit by his own dog. In winter foot pads can crack and bleed especially if a dog is walked on areas where salt is used. In addition to being hard to heal, it is also painful for the dog. A paw wax product called Musher’s Secret is wonderful for preventing cracked footpads. It is also a good idea to have some quick first aid references. Is your home safe for your dogs? Fencing your yard is a good step towards keeping your dog safe. 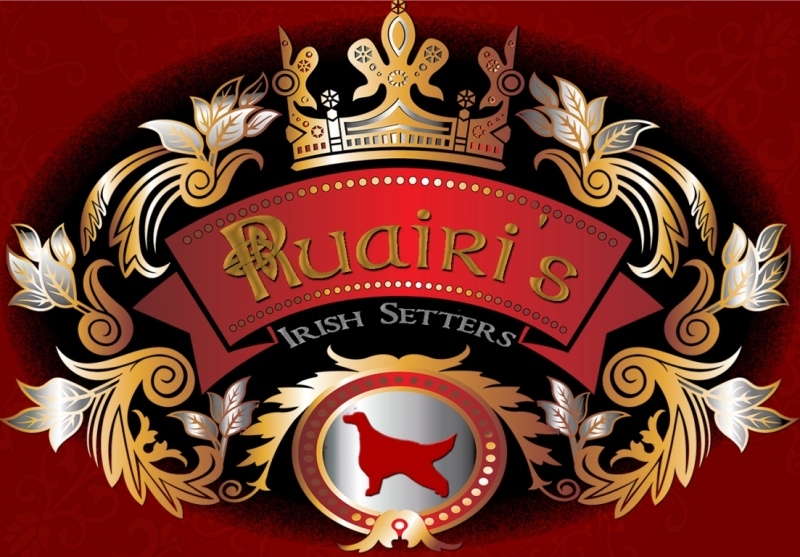 Car accidents are a common cause of death for young Irish Setters. Putting up a fence reduces the likelihood that your dog will follow its nose out into a street and into trouble. In addition to keeping your dog in your yard, fences keep many things (stray dogs, other animals) out. Fenced yards also allow a dog to freely run and exercise, and is a convenience for owners. Having to put your dog on a leash every time it needs to go outside is cumbersome compared to being able to open the back door. A fence needs to be high enough so that your dog can not jump over it (in winter, the height of the fence is reduced when there is a lot of snow). Fences can be attractive, just make sure that your dog cannot squeeze between gaps in boards or underneath the fence. Fenced areas do not need to be huge, just large enough so a dog can stretch out his limbs. Many people with small fenced areas also take their dogs to dog parks for runs or take walks with their dogs. In some neighborhoods fences are not allowed, and many people ask us about invisible fencing. An invisible fence is better than no fence at all, and are successful for some dogs. However, they are not the same as a physical fence. Some dogs will take the shock and go through the invisible fence if there is something exciting on the other side. Invisible fences can keep your dog in your yard, but do not prevent animals from straying into your yard. And of course, if the power goes out so does your fence. For some situations, an invisible fence is the only option, and is certainly preferable to no fence at all. We strongly recommend crate training dogs, especially if you have a household with multiple dogs. When you cannot be home to watch your dogs, securing your dog in a crate guarantees they are not finding trouble in your house or with each other. We did not use a crate with our first Irish, and often came home to find the destructive projects he had kept himself occupied with throughout the day. Crates also make car travel safer, and are useful if you need to confine an injured dog. Most dogs appreciate their crates as “their place,” and will even go in them for naps. They are especially useful for puppies who sometimes do not realize they need sleep and rest. There are differences in quality in both metal and plastic crates. Look for a heavy gauge crate with easy to use latches. A good quality crate is worth the investment. Just like toddlers, dogs can get into places you do not expect and are quite creative about finding trouble. Chewing on electric cords, swallowing items discarded in the trash (such as nylons), swallowing prescription medication, eating poisonous foods or plants, and licking lethal chemicals such as antifreeze, are some common ways dogs do serious damage to themselves. Many human medications (Pain killers, cold medicines, antidepressants, vitamins, diet pills) can be potentially lethal even in small dosages. For example, one regular strength (200 mg) ibuprofen tablet can cause stomach ulcers in a 10-pound dog. Fly baits containing methomyl and slug and snail baits containing metaldehyde are particularly dangerous. Antifreeze. Dogs like the taste of antifreeze and will often ingest it by licking leaks off of garage floors. It is lethal. Liquid potpourris: some types can cause severe mouth, skin, and eye damage. Batteries contain corrosives, and if ingested they can cause ulceration to the mouth, tongue, and the rest of the gastrointestinal tract. The following substances are considered non-toxic to dogs, although owners are typically upset and worried when they discover that their dogs have gotten into the substances listed below. These substances may cause upset stomachs in some animals. Many of the same techniques used to “child proof” a home work equally well for dogs. Store poisonous products such as pesticides, insecticides, herbicides, fertilizers, antifreeze, rat and ant bait, household cleaning products etc. in areas that will always be inaccessible to pets. If this is not possible, install childproof latches on dog level cupboards. If you have treated an area with a pesticide, insecticide, or herbicide, keep your dog away from the area for the recommended amount of time. We know of dogs that have died after absorbing poisons from chemically treated lawns through their footpads. Cover up or hide electrical cords and never let your pet chew on them. Make sure the toys you buy have no plastic eyes or other parts that can be chewed off and swallowed. If possible, put up your Christmas tree in a room that you can keep the dog out of. Ribbons or tinsel can become lodged in the intestines and cause intestinal blockage, glass ornaments can cause internal laceration when ingested, and dogs can get the lights wrapped around their heads and pull the tree down.